What is Aitz Chaim’s Minhag? As we prepare to enter the year 5772 and schedule our services for the year, I think it a good idea for our community to continue to discuss our rituals and traditions. We have a ritual committee. Unfortunately, that committee has not had a meeting since 2005. In the coming weeks, I am going to put together a document outlining our minhag. In the meantime, please find after the “more” link copies of the minutes from our 2005 Ritual Committee meetings. Please read and give us your comments! The meeting was called to order by Marjorie Feldman, Aitz Chaim‚s President. Membership in the committee was open to any member of Aitz Chaim that wished to join the committee. Therefore, the member attendees that chose to attend the meeting were deemed to be members of the committee. As a first order of business, Marjorie declared that the job of this committee was to produce a document that could be used in future years as a reference for the minchag, or rituals, that were employed by Aitz Chaim. The committee then appointed Aaron Weissman to act as chair of the committee and Cece Drew to act as recording secretary. Next, all members introduced themselves and discussed the philosophies that would guide them in the process. Areas of special interest for a number of members included maintaining shalom bayit, or peace in our community, when putting to paper new minchag, as well as previously vague minchagthat had been practiced by the community. An issue that will be of significant discussion is the maintenance of gender neutrality in Aitz Chaim religious practices. The committee then turned to discussion of the rituals that the congregation should practice when calling an aliyah to the Torah. The chair moved to the first item on the agendas printed by Marjorie before the meeting, whether or not an individual‚s family tribe should be considered in the order of aliyot called to the Torah. Jerry Weissman pointed out that it had always been the tradition of the Great Falls Jewish community to honor a Kohen with the first aliyah. Aaron Weissman brought up that if the congregation is to follow this tradition, then other rabbinical laws surrounding the order of calling an individual to the Torah must also be followed. A Kohen must always be called for the aliyah to the Torah. No kohen may be called for any later aliyot during that service. In the rare occasion that a Kohen is not present a Levite must be called for the first aliyah. If neither a Kohen nor a Levite is present, any Jewish member of the congregation may be called for the first aliyah. The motion was seconded and passed by unanimous approval. The committee then discussed how many aliyot should be called. Jerry Weissman brought up that we should increase the number of aliyah to ensure that more people have an opportunity to be honored by the congregation. Wendy Weissman pointed out that it is often very difficult to find three congregants who desire the honor. After some debate, Marjorie moved that during Torah services during Rosh Hashanah or Yom Kippur, the congregation should honor five congregants with the honor of aliyah. The committee further decided that during any other service, the congregation should honor three congregants with the honor of aliyah. These aliyah are for only the honor of reading before the Torah. Such honors do not include other honors that could also be considered aliyah, such as hagbah. A discussion ensued about who the congregation should deem qualified for aliyah. Aaron Weissman tabled the issue for discussion at a later meeting, as part of a future discussion on what criteria the congregation should require for an individual to meet for a series of honors and obligations. The chair then moved the discussion to what ritual clothing should be worn by congregants honored with aliyah. The chair moved that any man honored with aliyah should be required to wear both talit and kippah. The motion was seconded and passed by unanimous approval. A discussion followed that our community also honors women with aliyah, which is a new practice by Jewish communities. Marjorie pointed out that while it was traditional for men to wear both kippot and talit, no such tradition had ever been practiced by women. Aaron Weissman brought up that if one of our guidelines was gender equality, then women honored with aliyah should be required to wear the same ritual clothing as men. As the hour was getting late, the chair tabled this discussion for a future meeting. The time and date for the next meeting was set for October 23, at 5:30 p.m., at Aaron and Wendy Weissman‚s home. The meeting was adjourned by unanimous consent. The meeting was called to order by Aaron Weissman, committee chair. The chair moved to the first order of business, the approval of the minutes of the meeting of September 7. Arny Schandelson brought up that we are a very diverse group, and that the creation of a comprehensive set of minchag will be almost impossible if we do not define who we are as a community. Are we a traditional reform community? Are we Conservative? Are we some sort of mixture? Wendy Weissman expressed that we most appear to be a Reform community, but one that adheres to certain traditions more commonly seen in Conservative and Orthodox communities. The discussion came back to the minutes of the September 7 meeting. Arny Schandelson brought up that if we are going to follow the tradition of calling a Kohen for the first aliyah to the Torah, we can not play “fast and loose” with the definition of a Kohen. The traditional definition of a Kohen is a male born to a father who is a Kohen. There was no objection to approving the minutes with the proviso that the meaning of the resolution passed in the September 7 meeting was for a kohen meeting such a criterion. The minutes were approved. The chair moved to new business, namely the approval of a series of chapters for the minchag book the committee is to write. After some discussion, Marjorie Feldman moved for the following series of chapters, seconded by the chair. The motion passed by unanimous consent. The chair moved to the next order of business, which is to begin discussion on chapter 2a, Friday night prayers and procedures. The first item that came up for discussion was how the various reading, honors and rituals would be assigned to congregants. Wendy Weissman moved that a member of the ritual committee would work with the service leader to find out what slots needed to be filled before each service, and would assign parts based on attendance that evening. The motion carried by unanimous consent. Marjorie Feldman brought up the next item for discussion, namely what procedures we were to follow if a minyan was not present. A general discussion followed regarding what exactly constituted a minyan. Marjorie wondered if non-Jews attending services would count toward a minyan. It was the general consensus of the committee that they should not count. Marjorie also pointed out that she felt that children of Jewish congregants should count toward a minyan. Aaron, Wendy and Arny said that they should not. Aaron then presented definitions from Jewish Literacy by Rabbi Joseph Telushkin and from The Jewish Book of Why by Alfred J. Kolatch that defined a minyan as ten Jewish males. Aaron then presented a motion that for the purposes of Aitz Chaim, a minyan should be defined as ten Jewish adults; namely persons at least the age of thirteen. 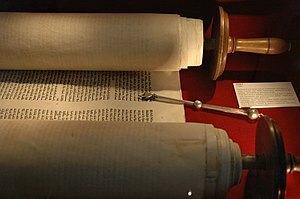 The torah could count as a tenth person if nine Jewish adults were present. Marjorie presented an amendment that the congregation should accept the leaders’ discretion as to whether a minyan was present. Aaron accepted the amendment, and the motion passed with no objection. A general discussion then followed as to what prayers and rituals could not be recited when a minyan was not present. Marjorie said that halacha requires a minyan to be present for recitation of the Amidah, reading of the Torah and recitation of the Mourner’s Kaddish. The chair moved to table this discussion to the next meeting, as the hour was growing late. With no objection, the discussion was tabled. Ram’s Horn policy for printing yahrtzeit memorials: Yahrzeit memorials will be printed if the Jewish month on which the yahrtzeit falls matches the Jewish months falling on the same English month as the date of the issue. If the Jewish month is unknown, memorials will be printed if the English month of passing matches either the same English month or the two surrounding English months of the date of the issue. In addition, yahrtzeit memorials will be printed in each issue for one calendar year following the date of passing. Yahrzeit memorials are taken from the Aitz Chaim yahrtzeit list, maintained by the Ram’s Horn. It was generally agreed that this policy was excessively wordy, and that it would be revised at a future meeting. The meeting was then adjourned by unanimous consent. Posted on August 24, 2011, in August, 2011 and tagged Jews, Judaism, Minhag, Religion and Spirituality, Ritual, Torah. Bookmark the permalink. Leave a comment.